Smiling Panda Faces line this white grosgrain ribbon. 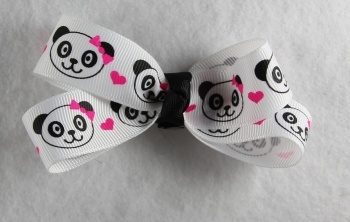 This girl bear has a pink ribbon in her ear and there is also pink hearts on it. This ribbon is 7/8" wide and wrapped into a French knot with a black grosgrain ribbon. This is the perfect size for the little ones, get two and this is great for ponytails too.